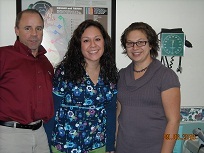 Welcome to Westford Family Chiropractic! Spreading Health & Happiness One Adjustment at a Time! Our thanks to our patients who made our clinic, Wicked Local's "Reader's Choice Award" for top chiropractor in Westford. Trying to find a gentle and caring chiropractor in Westford, Massachusetts for yourself or your family? For your chiropractic health, you have come to the right place! Westford Family Chiropractic is owned and operated by Dr. Richard J. Leigh, who graduated from Northwestern College of Chiropractic in 1990 (24+ years of experience). Dr. Leigh and his compassionate staff take great pride in the way they practice effective family chiropractic and wellness. Read patient testimonials. I am Doctor Richard Leigh and I have been practicing chiropractic for over 27 years. I opened Westford Family Chiropractic, P.C. in 1992 and have been providing the Westford, Massachusetts area with over 25 years of what we feel is quality, natural healthcare. Specializing in chiropractic care and wellness, I hope to be your chiropractor and am committed to providing pain relief, correction and wellness for many conditions using proven methods which are gentle and safe. Our chiropractic office will provide you with a higher quality, more active and pain free life. Don't just take our word for it though; visit our testimonials page to see what our patients have to say. At Westford Family Chiropractic, P.C. our primary focus of care is the Spinal Adjustment, but you will also receive the most effective care through the use of modern chiropractic techniques and technology such as Laser therapy, spinal decompression therapy, electrical muscle stimulation, ultrasound therapy, neck and back strengthening exercises, physioball core exercises etc. Dr. Richard Leigh and the staff at Westford Family Chiropractic have a genuine concern for your health and well-being! Call us today and we can develop a chiropractic plan specific for you. We wish to be your chiropractic care and wellness center. The history of Westford Family Chiropractic began in the mid-1970's when I was first introduced to chiropractic care by a well known Chiropractor in LaCrosse, WI; Dr. Fred Barge. Dr. Barge was author of numerous chiropractic text books, researcher of scoliosis and an educational speaker. His influence and that of his associate, Dr. Charles Price directed me along my path...by the 10th grade I wanted to be a chiropractor. After graduation from Northwestern College of Chiropractic I fine tuned my skills and techniques at Barge & Barge Chiropractic Center in LaCrosse, WI, preparing me for the day that I opened Westford Family Chiropractic, PC in late 1992. To receive free wellness and health articles subscribe to our e-newsletter. If you are already a newsletter subscriber, please explore the member wellness section of our website for animated exercise videos, wellness articles, chiropractic resources, and health facts specifically targeted to your wellness needs and interests by Dr. Leigh.